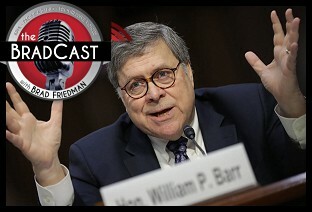 " Failing the Barr Exam: 'BradCast' 3/26/2019	"
We're joined today by HEATHER DIGBY PARTON, who has been covering the corrupt Trump Presidency for years now, including its various Russia-related storylines and other criminal probes at Salon and Digby's Hullabaloo. Among our several related topics of discussion today: Shameful failures by the media and others to demand independently verifiable evidence of speculative allegations both before the confidential Mueller Report was finally delivered to Barr and the subsequent failure by many of the same organizations and individuals in their credulous reporting of Barr's bare-bones, "very, very clever political document" summarizing the sprawling, two-year probe. Rather than learning from mistakes, many in the media seem to be repeating them all over again in the wake of Barr's memo, which some justifiably regard as a "whitewash" or "cover-up" by a man who was selected by Trump, in no small part, for his previously stated opposition to the probe and to the very notion that any President can legally be charged with Obstruction of Justice. There's much more related conversation here today --- including on the substance of Barr's letter, Deputy AG Rod Rosenstein's curious complicity, and the GOP's premature victory laps --- but you'll have to tune in to listen. Also on today's program: Though Democrats led a decisive 248 to 181 vote today (with 14 Republicans) in hopes of overriding Trump's veto of the resolution blocking his phony "national emergency" declaration, the effort fell 38 votes shy of the two-thirds majority needed. In the Senate, where 12 Republicans previously voted with Democrats, 59 to 41, to block the President previously, no override vote will now be held since a two-thirds majority vote is required in both chambers. AP described Trump's overwhelming loss in both chambers as a "victory" for the President today, and it will now be left to challenges in court to block Trump's order diverting billions appropriated by Congress to the military to instead build his border wall. Mexico is still not paying for it. « PREVIOUS STORY "'Green News Report' - March 26, 2019"
"Failing the Barr Exam: 'BradCast' 3/26/2019"
The credibility gap started in 1968, by the LBJ Administration. During the Viet Nam War, various parts of the government reported on events in Viet Nam, citing different numbers of casualties FOR THE SAME DAY"S battle.